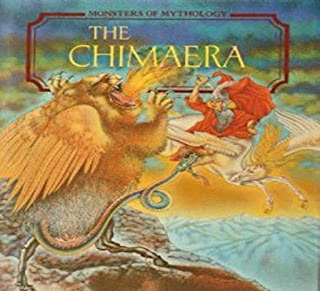 "...a boy’s aspirations, a king’s cruelty, a poet’s dreams..."
The Chimaera – a fire-breathing winged monster with the head of a lion, the body of a goat, and the tail of a serpent. Plaguing the lands of the Middle Sea, this fantastic creature comes into confrontation with the young hero, Bellerophon. The youth proves to be a worthy match, having already succeeded in his conquest of the tyrant king, Melicertes. Bellerophon’s adventures, which reach a climax in his battle with the Chimaera, provide a rich and powerful story of young ambition, evil intention, and poetic desire. The tale of the Chimaera is one of conflicting emotions, and the endless struggle against the demands of fate. It is about a boy’s aspirations, a king’s cruelty, a poet’s dreams, and the capricious nature of the gods – all magnified and illuminated within the turbulent world of myth.